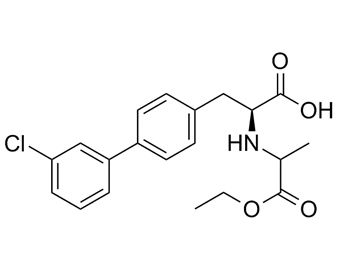 LHW090-A7 is a compound developed as an inhibitor of neutral endopeptidase (NEP), an enzyme responsible for the metabolic inactivation of enkephalins.1 Inhibitors of NEP have been shown to increase plasma levels of endogenous atrial natriuretic peptides and, as such, are expected to induce natriuretic and diuretic effects. 1. Iwaki, Y. ,Kawanami, T. ,Ksander, G. M., et al. Substituted carbamoylmethylamino acetic acid derivatives as novel NEP inhibitors. (2011).